Wonderfully there were more people demonstrating yesterday. Numbers from 40,000 to 100,000. It's a beautiful thing and makes my heart lift. There is now a curfew, 9pm-5am, announced late last night. And no gatherings of 3 people or more are allowed, according to ABC news - some say more than 5 but really, what's the difference. Loudspeaker announcements added that these conditions were to last for 60 days. Troops surround monasteries and armed soldiers are patrolling the streets. In another possible sign of a looming clash, a well-placed source said detained democracy leader Aung San Suu Kyi had been moved to the notorious Insein prison on Sunday, a day after she appeared in front of her house to greet marching monks. Bush has spoken of tightening economic sanctions against Burma/Myanmar but these are more likely to, again, hurt the people and not matter a toss to the Generals. "Americans are outraged by the situation in Burma,'' Bush said in an address Tuesday to the U.N. General Assembly in New York. Bush said the U.S. would tighten economic sanctions on leaders of the regime and their financial backers, and impose an expanded visa ban on those responsible for human rights violations and their families. The European Union also threatened to strengthen existing sanctions against the regime if it uses violence to put down the demonstrations. Britain's ambassador to Myanmar, Mark Canning, met Tuesday with some of Myanmar's leaders, urging continued restraint. "It will be disastrous in the eyes of the world on Myanmar if the authorities use force,'' he told them, saying that they assured him the situation would be handled with caution. The main reason that there is some hope of restraint - that thousands may not again be murdered, as in the last protests in 1988 - is that Burma's ally and neighbour, China, is hosting the Olympics and will not want such an atrocity associated with them. Got to have our best face on for the Olympics now! Well, at least all that Olympic's nonsense might be put to some good use for once. The military is using batons and tear gas, Charles Petrie, the United Nations humanitarian coordinator in Myanmar, said in a telephone interview from the city. Officials warned civilians over loudhailers not to take part in protests, U.K. Ambassador Mark Canning said by telephone. Police fired warning shots into the air and tear gas at about 1,000 protesters, led by Buddhist monks, marching to Yangon's Sule Pagoda today in defiance of a ban on public gatherings, Agence France-Presse reported. After the crowd scattered in the frenzy of beatings, armed soldiers used barbed wire to cordon off the area around the Shewdagon Pagoda. About 500 monks were believed to be holed up inside. 11pm -- Earlier reports were one dead, 5 injured. Now Lateline reports there are 4 dead, 100 injured, and the UN has organised an emergency meeting. Two of the monks were beaten to death while another was shot when he tried to wrestle a gun away from a soldier and the weapon discharged, two senior Myanmar officials told AFP. A fourth man, who was not a monk, was pronounced dead on arrival at Yangon General Hospital with gunshot wounds, a hospital source said. At least 100 people were injured during the day and some 200 people were arrested, as many as half of them Buddhist monks, according to witnesses and diplomats. Another report says: About 300 monks and activists were arrested across Yangon after braving government orders to stay home, according to an exile dissident group, and reporters saw a number of monks, who are highly revered in Myanmar, being dragged into trucks. And in The Age: As word of beatings, shootings and arrests spread, protest marches continued. Witnesses said thousands of onlookers cheered as about 1000 monks shrugged off the heavy presence of soldiers and police and kept marching towards the centre of Rangoon. The crowd roared approval for the monks and shouted at security forces: "You are fools! You are fools!" Ms Suu Kyi's National League for Democracy party released a statement saying the military regime had committed "the greatest, irreparable wrong in history" by beating monks. "They even insult our religion and our monks," a businessman aged in his 50s said as he ran from the tear gas alongside monks who held wet cloths to their faces. Elsewhere in Rangoon, monks marching to the home of the pro-democracy leader, Aung San Suu Kyi, urged supporters to stand back and let them alone challenge the might of the hardline regime that has ruled Burma for more than four decades. "We monks will do this, please don't join us," they said. "Don't do anything violent. We will send loving kindness to them," they said of the military presence. 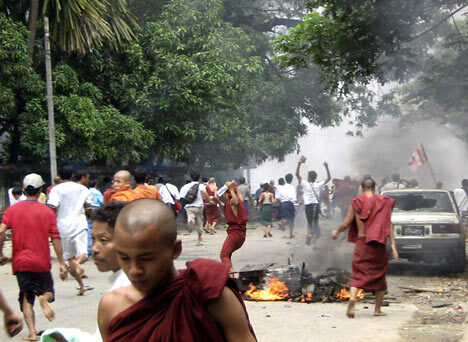 "Many taxi drivers who are at the site of the violence take injured monks to nearest hospitals. The junta are using dirty tactics - they don't fire guns, but beat people with the back of their rifles. The monks defiantly did not fight back, endured the pain and died."